Enjoy winter on the glorious coast of Maine where the winter ocean looks like sapphires and the white caps look like diamonds!! Immaculate, breezy and bright, this rental is a short walk to the beach on a well maintained boardwalk. The apartment is fully furnished, including all linens, towels, kitchen supplies, soaps, tissues, wifi, Cable TV with Premium channels, beach chairs and beach towels etc. The entrance to the apartment is from the outside and is on the opposite side of the house from the main house. The apartment is situated so it is private and not visible from the living area of the main house. There is hardwood and tile throughout, a small 8x8 deck overlooking Great Pond and open fields. Check the map below to see our nearness to the beach. There is a luxury Inn (Inn by the Sea) across the street and a boardwalk to the beach. The restaurant (is excellent) and spa are open to the public. Air conditioning, although available, is rarely needed in this unique location, providing a chance to smell the ocean and hear the surf as you drift off to sleep. A larger map shows we are at the head of a peninsula (Penrhyn Y Mor) with the open ocean on three sides. We are located about 7 miles from the city of Portland. Although this is a beach vacation destination there is no build up of commerce and we maintain a quiet, rural atmosphere with farm fields, wildlife and open spaces. If you book late June and early July you can walk across the street and pick your own strawberries. The farm fields also allow amazing sunsets until the last sliver of sun is visible. When you are ready for the evening the city of Portland is a ten minute drive. Reservations are recommended at most fine restaurants. If you do have to wait for a table the walk around the cobblestone streets of the Old Port is more than charming. You’ll find a spectrum of activity from a working waterfront to fine dining, local breweries and vibrant nightlife. 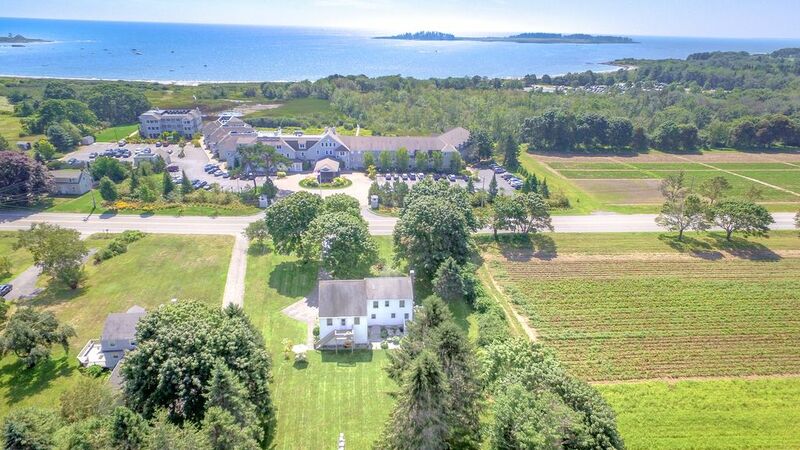 Join us for a quality coast of Maine get away. Mark and I are always available for questions and suggestions. We have been renting to travellers for 17 years. Ours is a special location for access to the ocean and pleasant temperatures allowing us to escape oppressive summer heat. For us it is paradise. We hope you will agree. Cape Elizabeth is a bit of a small penninsula. We are on the eastern most tip so there is water on three sides of our location. When the thermometer reaches into the 90's in South Portland we are likely in the 80's and breezy. Privacy with access to hosts on site. full, flat accessible back yard. We held our daughters wedding in the backyard. The Inn by the Sea is across the street. Explore their website and find a gourmet restaurant and a spa. It is a beautiful facility with a staff that gets it right. Elegant and casual, perfect for vacationers on the coast of Maine. Portland Maine, 7 miles away, has more restaurants per capita than any other US city. Reservations are necessary at many of the restaurants. Loved staying here. Great location and super clean and comfortable. Would definitely recommend! We had a lovely day exploring Portland and all along the coast. The host Laura was very friendly and helpful. I'd definitely come back. Thank you for choosing our location. 😊 Come back and see us again sometime. We had an amazing stay. Laura’s apartment is clean and neat, there was plenty of room for our family of four. Nice backyard for the kids to play. Location is perfect, a short walk to the beach, a little ice cream stand up the road and an easy drive into Portland. Looking forward to our next visit! Thank you for choosing our location. We were very happy to see you relax and feel at home here. Please come again when you need a home away from home in Maine. The space was very comfortable and the location was ideal for our plans to visit family in Cape Elizabeth and tour Portland and the nearby towns. We also appreciated the easy access to the beach. Our daughters were enchanted by Maine and are eager to return! It was the perfect fit for our couple of days in the area. We totally enjoyed our stay with Laura and Mark Morris and their dog Rosa. The apartment was very nice and the ac was fully engaged upon arrival which was very much appreciated. Laura provided great dining and beaching suggestions and also offered us a bag of DD coffee when I incorrectly thought I forgot to pack my coffee. The property is a short walk from Crescent State Park Beach. You can cut thru the Inn at the Sea lobby and access the beach. I found Cape Elizabeth to a be sleepy and pleasant community and would stay here again. If you want something with more action, you can visit Portland or Old Orchard Beach. Enjoy! Where should I begin to list all of the positives about this rental property!! The landlords, Laura and Mark, were extremely friendly and personable!! They made us feel like family and actually seemed to care about our sons and their futures! This was our very first time ever renting a place through an on-line agency and I can say that Laura and Mark have put our faith in renting at an all-time high. The extreme cleanliness of the apartment and the overall experience we encountered were truly commendable! The property was located near everything and anything you would ever want/need to explore! Laura even gave us suggestions on where to buy lobsters to take home as well as good tips on what to see in the area. Fort Williams was such a beautiful place full of so much history, I felt that we were getting an education as well as just being on vacation. I can't wait until we are able to enjoy this property again in the near future!! It will definitely be our home away from home when we visit Maine again!! I didn't want to leave and I can't wait to return!!! Although the apartment was across the street from the Inn by the Sea, it was extremely quiet! You would never know there was a hotel across the street! The beach behind Inn by the Sea was a sandy beach and it was so peaceful to let your worries slip away while you walked the beach. Thank you Laura and Mark for being such wonderful landlords! We look forward to seeing you again! !